Lack of leadership on this issue. Except for Tommy Smigiel, no one on council has thought outside the box on how to elect the school board. Council members should have known that Norfolk voters would approve the referendum for elected school boards; not a single one that has made it to the ballot has failed. Somebody should have been compiling what other localities have done and what we could do in Norfolk. I guess it was easier to just maintain the status quo – wards – than think about it more. Contrary to popular belief, one does not become a leader simply by getting elected. Leadership is doing, not a position. During the meeting, Smigiel expressed frustration with those who support voting by wards. Had council shown some leadership, their paternalism wouldn’t have been so blatant. To be dismissive of the citizens of Norfolk is something that this council has done for far too long. That’s why I decided to contact my friend, Sen. Kenny Alexander, and help him put in a bill that would give the people what they voted for. The bill, as drafted, is a placeholder and a substitute will be offered. In the meantime, I hope council will give due consideration to Smigiel’s hybrid proposal (click to enlarge). I’m not alone in not wanting wards for our school board. What’s the difference between wards and congressional districts? In what context, other than one being local and the other federal? The underlying principles are the same: one man, one vote. So you think we should get rid of congressional districts, too? At first blush, I see merit in Tommy’s hybrid proposal (as described in the jpeg above), but I have a few questions. 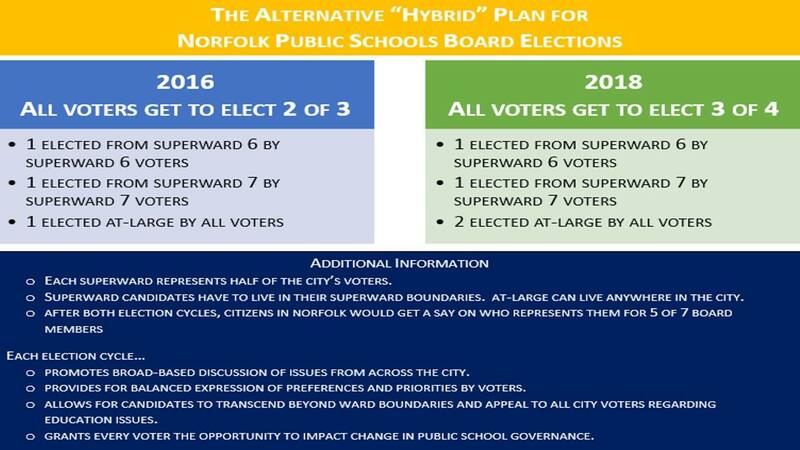 When he says that in 2018, two at-large members would be elected by “all voters,” and citizens in Norfolk would thereafter “get a say on who represents them for 5 of 7 board members,” what precisely does he mean? Does every voter get to vote twice for at-large members in 2018? How many votes do each of them get in subsequent cycles? I’m not opposed to wards as a general matter, but in this particular instance, I agree with the problems you identified with Norfolk’s ward system. I particularly feel wary of racially- and geographically divided wards when it comes to school boards. A dysfunctional and racially segregated electoral system is a poor vehicle for managing a viable, racially integrated school district. At the same time, my first reading of his plan seems like it would be susceptible to electoral gamesmanship–particularly a not-insignificant amount of single-shotting. Rather than trying to earn votes from a broad base of voters across the city, a number of candidates may succeed by convincing a relatively small base not to vote for anyone else. I think that defeats the noble goal of having most members accountable to every voter, and I’d like to know whether and how Tommy’s plan addresses that possibility. Norfolk’s ward system is designed in such a way as to allow each citizen to only vote for 3 of the 8 members, which means we never get to vote for a majority of the members. Remember – our ward system consists of 5 small wards – roughly 1/5 of the city in each – overlaid by two superwards, each of which covers half the city. Each voter gets to elect a ward representative, a superward representative and the mayor. What Tommy is proposing is that 4 members – two from each superward – be elected plus three at-large members. So each voter will have 5 members on the school board that are accountable to them – 2 from their superward and 3 at large. Only a true at-large system would make each of the school board members accountable to every voter. Virginia Beach uses such a system – but to make it geographically diverse, they have residency requirements for some seats (meaning you have to live in the district to run) and the rest run city-wide. All of the voters – not just those living in certain districts – vote for all of the candidates. Our ward system – racially based – is more dysfunctional than most realize. But that’s a post for another day. Yeah I get the distinction between Norfolk’s city council system and what Tommy’s proposed. What I mean is this, though: Virginia Beach also has some “at large” school board members (and City Council members). Ostensibly, each of the members elected “at large” are accountable to all of the voters in the city. On the other hand, multiple at large members are on the ballot each cycle. If N at-large seats are open, the top N vote earners are elected. Voters can cast a number of votes equal to the number of at-large slots open on the ballot. When a voter casts all of his votes, this sometimes creates perverse results because each of your votes for a candidate you prefer also functions as a vote against another candidate you prefer. In a crowded field of candidates, the solution that usually emerges out of game theory is single-shotting, i.e., only casting one vote for your first-choice candidate so you don’t risk giving your second vote to someone who might beat him out. The result is that organized candidates with a discrete base often beat disorganized candidates who might have broader appeal. I was wondering if Tommy had put anything in his plan to address that possibility–for instance, six year terms and only one at-large candidate on the ballot in any given cycle, The ward system as implemented in Norfolk is objectively terrible, but if blocks of voters start single-shotting on racial lines, at-large voting might be only a marginal improvement. Which is why I favor allowing the voters to cast multiple votes for the one candidate. They’re your votes, cast them however you wish! That was exactly the reasoning in Collins that gave us our current ward system. Single shot voting is a huge problem, I’m not entirely sure how it even passes the one man/one vote legal muster. But I love John Moss and there is no way he got re-elected last year without his 20k core supporters single shot voting for him. That’s how you beat a guy who spent $100k by only spending around 20k. One-man-one-vote is not a requirement. The only requirement is that all men get the same number of votes.